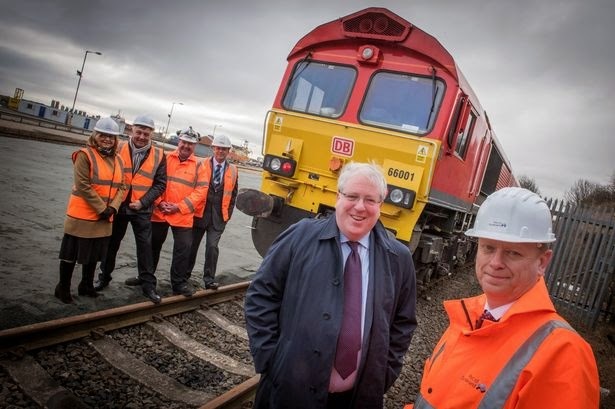 Transport Secretary Patrick McLoughlin visited Port of Sunderland to witness its rail lines being used for the first time in more than 20 years. Yesterday, a locomotive provided by BD Schenker Rail UK was given a trial run on the newly connected infrastructure, which will soon be used for commercial operations. The event followed work by Network Rail between December 2014 and January of this year to reinstate the former rail line. The move is set to boost the import and export credentials of the port which, despite being at the heart of the North East coastline, has not had working train lines for more than two decades. Port director Matthew Hunt said: “It’s fantastic to once again have rail connections at Port of Sunderland. We have always enjoyed great access to open sea, and the port is well placed in terms of its links to major roads and airports. Mr McLoughlin said: “As part of the Government’s long term economic plan, we are investing record amounts in improving road and rail connections so that ports like Sunderland can realise their full potential and contribute to regional growth. Overall, Network Rail reconnected almost half a mile of rail lines at the port, enabling an increase in the number of cargo handling projects it can manage. Already, the port handles more 700,000 of cargo every year. Neil McDonald, head of sales at DB Schenker Rail UK, said: “Britain’s ports are a vital link to overseas markets, but landing cargo in the port is not the end of the journey. “Excellent transport links from ports to cities are essential in order for shippers to reach their final customer, and rail ensures low carbon, low congestion transport.